Disclaimer: It should be obvious that the question in the title of this article – whether bitcoin will go back up to $1000 or more in value – is not one which anybody can answer with any certainty; anybody who tells you that they know for sure what is going to happen to the price of Bitcoin (or anything else) in the future should not be trusted, as they are trying to convince you to do something which is in their interest not yours. The purpose of this article is not, therefore, to provide a definitive answer to this question, but rather to explore some of the main arguments and data points to consider in forming your own opinion. In doing this I will be purely taking a long term perspective, with no consideration given to shorter term price movements. In the interests on full disclosure: I am personally long on Bitcoin, meaning that I am of the opinion that its price will rise. There can be little real doubt today that, at one thousand US dollars and above, Bitcoin was in an unsustainable price bubble. Clearly events since then, which have seen the price plunge down to lows of below $200, have proven this conclusively. The rapidity and depth of the fall from its highs of late 2013, and the length of time which has now passed since those highs, make it very difficult to argue that these prices were anything other than an over-exuberant speculative bubble. To some people this will already be seen as near conclusive evidence that we will never again see such high prices. But it gets worse. There is persuasive, although far from conclusive, evidence that this bubble was driven in large part by fraudulent trading bots at the now defunct exchange Mt. Gox. A bubble driven by misguided speculators who wrongly thought that Bitcoins were worth that much is one thing – but a bubble driven by the fraudulent actions of a single trader doesn’t even imply any significant level of demand at those prices from the most optimistic of bull traders. If these prices were a bubble then Bitcoin is clearly not worth that much, so why would it ever trade at that price again? In 2010 the price of 1 BTC surged from one cent to one dollar in the first and largest bubble: I’m sure you don’t need me to do such basic maths for you but that is a 100 times price increase. In April 2013 another clear bubble took the price from $30 to $270, a 9 times increase, before dropping back to a low of below $100. Not long after this a new bubble took the price from $140 up to $1140, an increase of a little over 8 times. Since then the price has fallen, but has never gone back as low as $140. There are also innocent explanations which could account for the supposedly suspicious bot activity on Mt. Gox during the most recent bubble; it has been suggested that they may have been operating on behalf of large traders who had negotiated a preferential fee structure with the exchange. The jury is still out on which explanation is true, but we certainly cannot say that with any certainty that the 2013 bubble was not genuine. 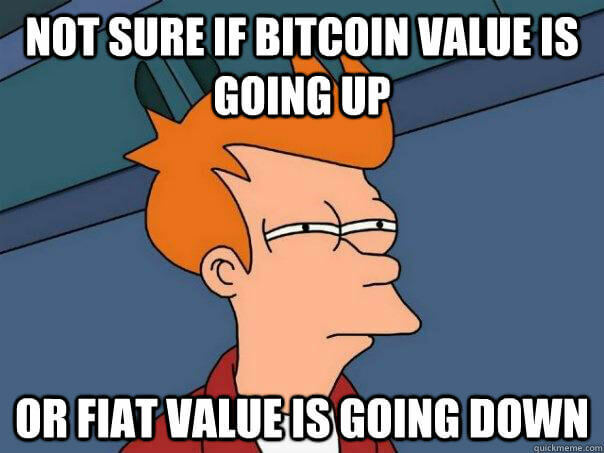 Bitcoin is a volatile asset, which has historically undergone a series of sudden price bubbles driven largely by investors and speculators, followed by more gradual declines during which the price loses a great deal of the value created during the bubble, but never gets a low as it was before the bubble happened. It is perhaps unlikely that the price will gradually climb back up to >$1000. If the price does reach new all time highs, it is more likely to come during a sudden spike. The next bubble, if it happens, is likely to be smaller than the last one in percentage terms but larger in dollar values. This has been the pattern through previous bubbles because as the base price (pre-bubble) rises larger amounts of new money are required to drive the increase. Of course it is totally possible that there will never be another bubble: Just because it something has happened in the past does not mean that it will happen again in the future, especially considering the increased investment required to drive a new bubble similar to previous ones. So none of this really tells us whether or not we will ever see four figure prices again – but it does tell us that as long as the price remains above the $140 value from which the last bubble started there is a significant chance for another jump. If we accept the maxim that patterns, once established, are more likely to continue than reverse (which is the foundation of technical analysis, a discipline used by many traders in traditional financial markets), then we should expect the probability of this happening to be somewhere above 50%. If the price drops below $140, however, then the this pattern will be broken. We might also conclude, based on the relative size of previous bubbles, that any such price surge should take the value of one coin to substantially higher than the $1140 seen in 2013. For example, a bubble launching from around $250 could be reasonably expected to get close to an 8 times increase, which would take us to a high somewhere in the region of $2000, whereas a bubble beginning at $400 might be expected to reach highs greater than 7*400 which would take us close to $3000. These figures are highly speculative, however. What Would it Take for Bitcoin to be Worth >$1000? 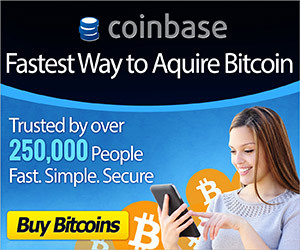 Since we are specifically considering the question of whether bitcoin will go up in price to match its all time high of 2013, it might be useful to consider the what levels of adoption and growth might justify this kind of price. In doing this I would like to put aside any value created by speculators betting on the value increasing in the future and ask whether it could reach that kind of level organically, if all speculation was removed from the market. Of course there will always be speculation, but we might reasonably expect that such traders will only buy up to levels which they think will be justified organically in the future: So the result of speculation should only be to increase the speed at which the price reaches levels that speculators think it would have reached anyway. Taking a very long term perspective: There will eventually be 21 million coins in existence. At a value of $1000 this would mean a total market capitalization of $21 billion USD. What would it take for that to be justified? This is a very difficult question to get to grips with. We can compare these numbers to a few other statistics which may help to put that kind of valuation into perspective, but the relevance of any particular comparison we choose is highly debatable. This whole section should therefore be taken with a healthy pinch of salt. Comparison #1: There are approximately 7 billion people in the world. This means that for an eventual value equal to $1000 there would have to be $3 worth of BTC for every person in the world. Another way to look at this is: if 1% of the world’s population owned Bitcoin they would need to have an average of $300 worth each. Intuitively, this feels very high to me, but as you will see below other statistics put a completely different spin on things. Comparison #2: The United Kingdom is a relatively small Island whose population of 64 million represents less than one percent of the total global population. The total value of all the UK’s currency currently in circulation is $87.5 billion USD. So at $1000 BTC would be valued at less than a quarter the value of GBP. And of course Bitcoin is a global currency with (arguably) a much greater potential as an international investment vehicle than GBP. If we take the USD itself, which is used as an international currency by many (but not all) countries for holding reserves and trading commodities, but rarely used by regular retailers outside of the United States in the way that Bitcoin is, we can see that at $1.38 trillion the USD is valued at 65 times more than a $1000 bitcoin. This means that if 1.5% of the USD economy moved into BTC we would hit $1000 even if there was no other use across the rest of the world. Comparison #3 Visa processes an average of around $9 billion in transactions each day. The total number of card transactions, including other major providers such as Mastercard, is obviously much higher than that. If Bitcoin gained a market share equal to 10% that of Visa and each coin was held for an average of just 23 days before being re-spent, this alone would require a Bitcoin value of at least $1000. At the time of writing this article the average daily USD transaction volume on the Bitcoin network is around $60-80 million USD, which is a little under 1% that of Visa. The value of BTC today is still held up in large part by speculation about what its future value may be, by investors anticipating future profits, rather than its actual value today. What this means is that very little needs to change for the price to fall. In fact, if nothing changes, it is highly likely to fall as investors and speculators move their money to places with a greater perceived potential for profits. At the moment there is a consistent trend upwards in various measures of adoption – the number of transactions, value of transactions, number of unique addresses being used and so on. Any stalling in this forward momentum, or worse an actual decline in usage, could easily lead to a fall in value. What’s more, with continued growth seemingly necessary to maintain current prices a substantial acceleration in the rate at which new users are acquired may be needed to drive any significant growth in value. There are also many potential pit-falls and problems over the horizon. Although the number of users does seem to be consistently growing, this growth appears relatively slow and shows little indication that BTC is about to break into the mainstream and gain millions of users. At least part of the current value may have been pricing in the possibility of mainstream adoption, so as more time passes without any in-roads in this direction investors may begin to sell, making it difficult for the price to rise substantially. It is also true to say that the altcoin market has often seemed to perform better than BTC recently. If cryptocurrency does break into the mainstream, it may be in the form of an alternative coin which improves on perceived limitations in the Bitcoin protocol. Political issues of all kinds may also hamper any future growth, including both government regulation and internal political issues such as the recent block size debate. What Drivers Could Make the Bitcoin Price Go Back Up? A Currency Crisis: Citizens of any country experiencing high inflation or currency devaluation have a strong incentive to look for alternatives to holding their wealth in fiat cash. Since the 2009 financial crisis most of the world has been going through a period of low inflation, however there is a significant probability in the medium term future that competitive devaluation by countries seeking to prop up exports, or out of inflationary currency crises in specific countries, could drive a new wave of users into Bitcoin. A Banking Crisis: Banking crises in both Cyprus and Greece appear to have been a driving factor behind minor price jumps in the past, as it highlights the possibility that keeping money in banking system may not be as safe as people think. Major Integrations: If, a trusted brand such as Paypal, for example, were to add the option of keeping BTC in their wallets we would almost certainly see a big jump in the number of users and therefore the price. Although that particular example may not seem very likely, there are dozens of others which could have a similar effect. The Halving: In the summer of 2016 the number of new coins being generated will halve. If the same amount of money keeps flowing into Bitcoin then the price will have to rise, and could easily push back into four figures. I’m quite sure that there are at least as many different opinions and perspectives on this topic as there are bitcoin users – so please do take a moment to share your views in the comments section! I regret not selling my bitcoin at > 1000. I’d be rich now if I did! I have hope for the future, but I think it will take a long time before we see anything like that again. Some people say it was based on a tradebot at MTGox. they were probably right, although I like to hope that they weren’t.